A common reaction about guys who are trapped in the break up zone is to question their masculinity or their ability to keep a woman interested and happy. Your self esteem can take a massive blow when she breaks up with you, right? This is why the key focus of this material is power! 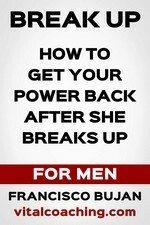 How to get your power back! These negative patterns in your head are doubts and doubts are simply cracks in the walls of your mind. They are weaknesses that allow negative feelings to flourish. Now, when you rebuild your power, your mental strength and your emotional foundation, you kick these doubts out and gain back this sense of ownership over you life. A doubt is an attack on your mind. It is an attack on your life. You can look at it like any other form of attack and realize that these thought forms don't belong to you. You can wrestle with negative thoughts and easily win this battle because you know that you have all the dignity and power to be respected as a human being. If you feel a gap... If you feel that your level of energy is not high enough and that you feel psychically vulnerable, you can rebuild strength in many ways! You can physically work out, develop your social network, refocus on your career, develop new spiritual and mind disciplines and much more. Power is a quality you can cultivate. You cultivate it as well through the way you stand in life. Watch your posture, body language and tone of voice. Gain back your social confidence by easily interacting and connecting with anyone. Once your level of power raizes back to 80-100% of you true potential, you notice that the limiting thoughts about your masculinity or any aspect of your personality naturally dissolve. Extra power IS the answer.